You can enable or disable some services provided by your modem for LAN and WAN connections. If no WAN connection is defined, only the LAN side can be configured. Click the Admin button to change the modems account passwords. 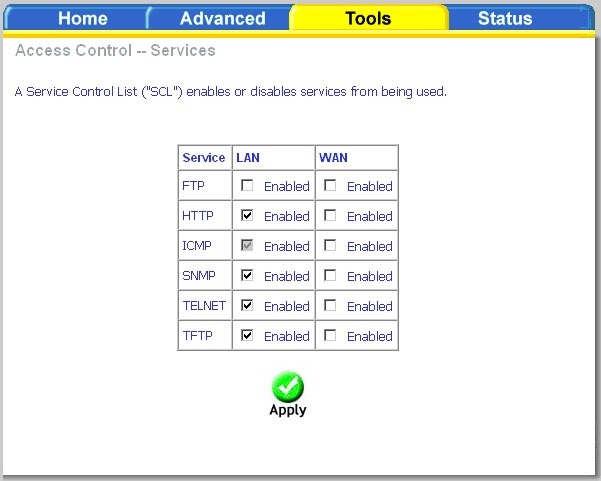 Click the Services button to configure what services are allowed to pass through the modem. 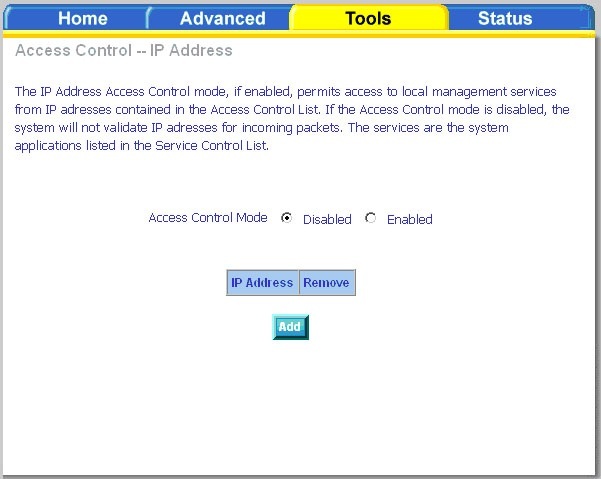 Click the IP Address button to define who is permitted access to local management features. There are three usernames and passwords (admin, support, and user) that can be used to control your modem. The passwords for these usernames can be changed on the Admin screen. Select the Username, enter the Old Password, enter a New Password, and then confirm the new password. When you are ready, click Apply at the bottom of the page. 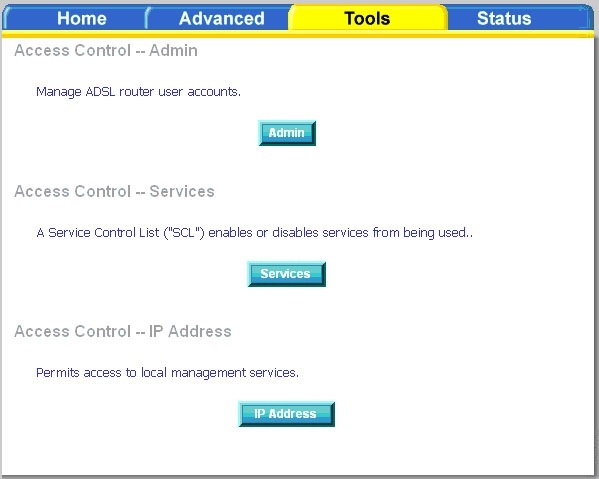 From this page you can enable/disable certain services from passing through your modem. Services that can be enabled/disabled on the LAN/WAN are FTP, HTTP, ICMP, SNMP, Telnet, and TFTP. FTP: (File Transfer Protocol) Used for file transfer. HTTP: (Hyper Text Transfer Protocol) A communications protocol that enables Web browsing. ICMP: (Internet Control Message Protocol) supports packets containing error, control, and informational messages. SNMP: (Simple Network Management Protocol) A protocol used for network management and monitoring network devices. Telnet: A standard Internet protocol for accessing remote systems. TFTP: (Trivial File Transfer Protocol) A very simple form of the File Transfer Protocol (FTP). Web access to the modem can be limited when Access Control Mode is enabled. 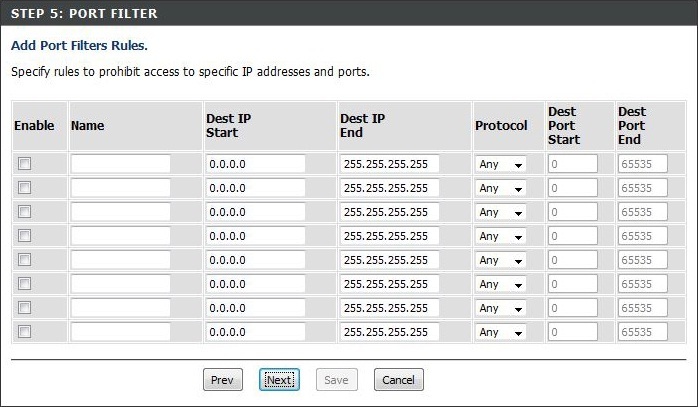 Add the IP address to the IP address list by clicking on the Add button, then select Enabled to enable Access Control Mode. 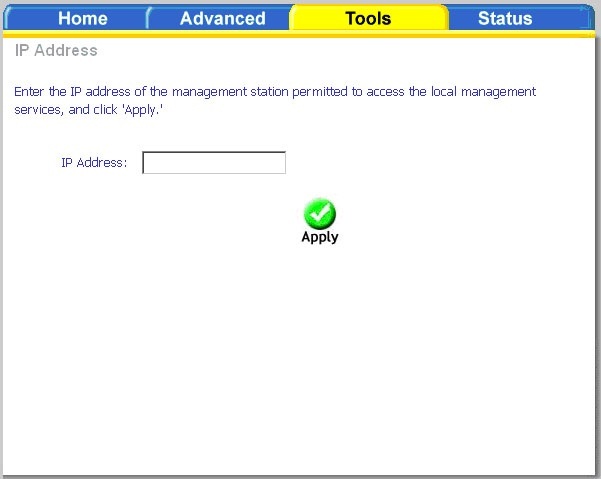 Enter the IP address of the management station permitted to access the local configuration and click Apply. This will return you to the previous screen where you can enable access control. If Access Control Mode is disabled, any workstation connected locally to your modem can access the web interface provided the correct username and password is supplied at log on. 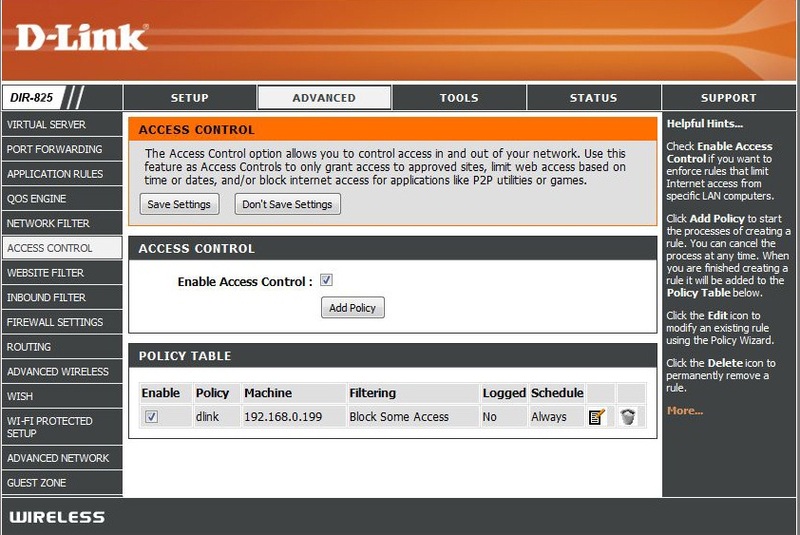 The Access Control section allows you to control access in and out of your network. Use this feature as Parental Controls to only grant access to approved sites, limit web access based on time or dates, and/or block access from applications like P2P utilities or games. Add Policy:Click the Add Policy button to start the Access Control Wizard. Select a schedule (I.E. Always) from the drop-down menu and then click Next to continue. • Address Type – Select IP address, MAC address, or Other Machines. • IP Address – Enter the IP address of the computer you want to apply the rule to. Enable – Check to enable the rule. Name – Enter a name for your rule. 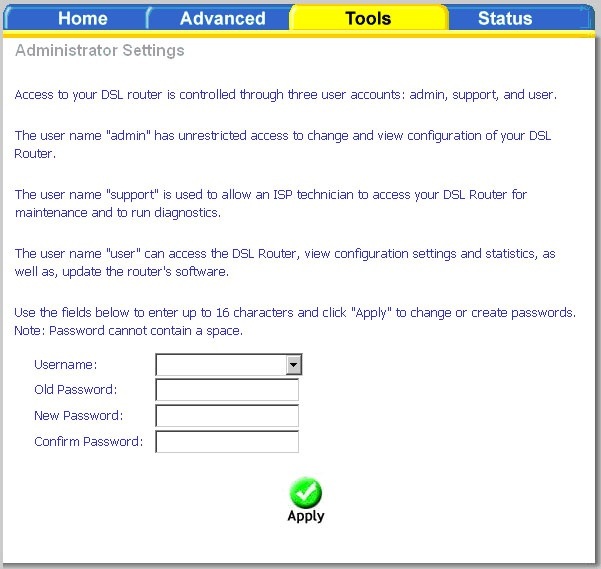 Dest IP Start – Enter the starting IP address. Dest IP End – Enter the ending IP address. Protocol – Select the protocol. Dest Port Start – Enter the starting port number. Dest Port End – Enter the ending port number.